If you’ve been watching the cameras at the Times Square building or following the recent reports from our fledge watchers, then you know that after 44 days of incubation, Beauty and Archer began disposing of the eggs in their nest box. All of the eggs turned out to be unviable. At the same time, watchers have reported that Unity has not been incubating her eggs for over a week. So at this time it seems unlikely that we’ll have any eyases in Rochester this summer. 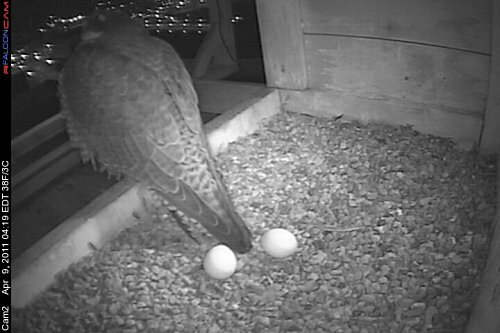 It is possible that Beauty and Archer could begin laying a new clutch of eggs. 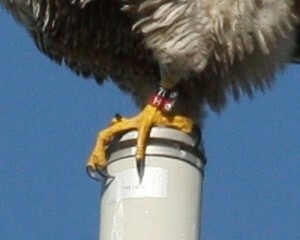 It’s unusual for Peregrines to double-clutch, but it’s not unheard of. As for Unity, it’s anyone’s guess what she’ll do. Undoubtedly the stress of having their nest sites relatively close together, combined with Archer splitting his time between both nests, contributed to this less-than-desirable outcome. 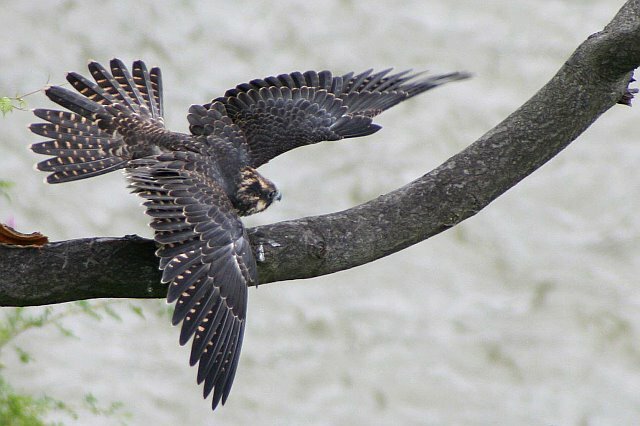 While we wait to see what will happen here, the Rochester peregrine falcon legacy continues a couple of hours north in Toronto, Canada. Rhea Mae (b. 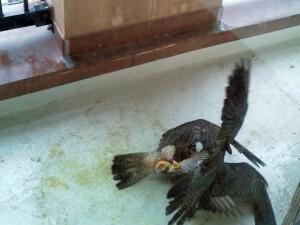 2006) and her mate Tiago are raising four eyases. They were recently banded by the Ontario Ministry of Natural Resources. 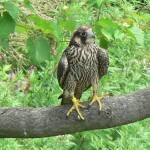 Rochester Falconcam team member Carol Phillips attended the banding and took plenty of pictures of the happy event. Not too far away, her sister Linn (b. 2007) and mate Ruben are raising 3 young eyases. And after settling down earlier this year, our cyber-falcon Quest (b. 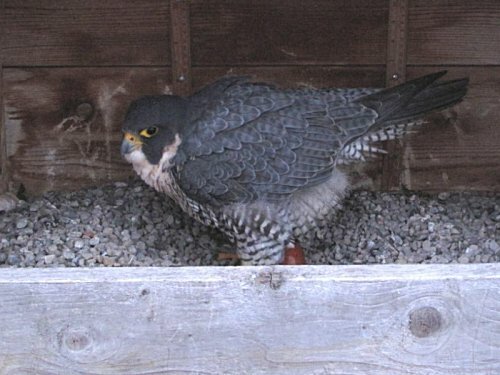 2008) has been incubating a single egg which just hatched within the past day or two. You can see more pictures of Quest, Kendal and their new eyas HERE. So even though things haven’t gone the way we’d like in Rochester, there’s plenty of good news this year for falcons that were hatched right here. Even before we knew Unity’s identity, Rochester Falconcam team member Carol Phillips was busy working with our good friends at Kodak to get access to the site for our crack team of watchers. Recently her persistence paid big dividends as Kodak invited a few observers to take a closer look. Falconcam team members Joyce Miller, Lou Capuano and Jim Pisello accompanied Carol to the power plant at Kodak Park’s Weiland Road location for a brief tour of the facility and our closest look yet at the site Unity has chosen for her nest this year. Bruce Moyer, from Kodak Corporate Security met everyone at the gate and led them inside. The power plant burns coal and oil to produce heat and generate electric power for many of the buildings throughout the Eastman Business Park complex. Kodak owns the facility, but it is operated by Duke Energy. Inside the team met Duke Energy’s Bernie and Ted, the plant managers, and geared up with hard hats, safety glasses and hearing protection. A ride up a freight elevator ended at the top floor where all the excess heat from the steam turbines made for a sauna-like experience. Ted, who had a previous life as a biologist, led the group onto the roof overlooking the nest area. From there, two eggs were plainly visible in the substrate on the protected ledge. The material on the ledge looks to be pigeon droppings, deposited over many years. Ted claimed the pigeon population had dwindled even before Unity’s arrival last year, and the team saw only a handful of birds while they were on site. Unity had put in an appearance earlier with an overhead fly-by that ended with her disappearing around the back side of the plant. Some more of the pictures from the tour, taken by Lou and Jim, can be seen in the slideshow below. With two eggs in the scrape, could a third be in the works? 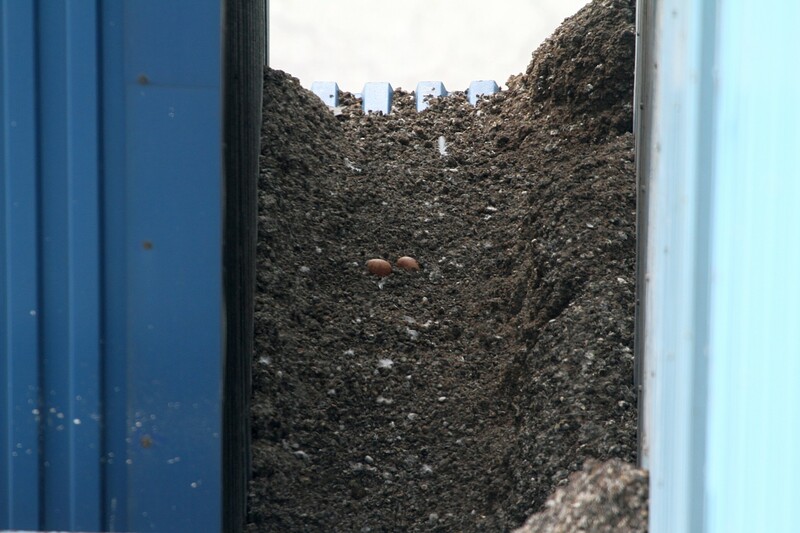 The plant operators noted that the last egg was laid many days ago, so it doesn’t seem likely that Unity will be laying another. And though the nest is not monitored actively, it was clear from interviewing the Duke Energy folks that Unity is not spending a great deal of time on the eggs. That’s not the behavior you’d expect for a falcon that’s in “hard” incubation mode. So what does that mean? 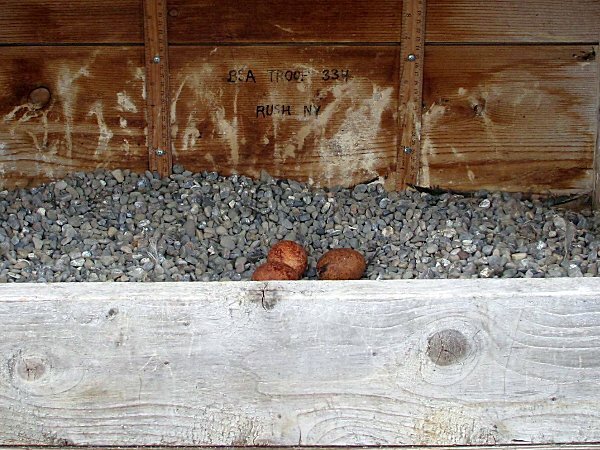 Given Unity’s young age and the fact that this is her first clutch, it’s possible that these eggs won’t hatch. It’s not all that unusual for a falcon’s first clutch to fail, and Unity is under some stresses which might contribute to a brooding failure. Her mate, Archer, is not around as much as he should be, since he’s spending a great deal of his time at his “primary” nest site with Beauty. That alone may mean that Unity has to spend a lot of time off the nest in order to feed herself, defend her territory, and so on. According to some reports from our watchers, she’s not showing too much interest in brooding, either. That could be a symptom, or a result of the stresses in her environment. The folks from Kodak and Duke Energy are enthusiastic about having a falcon family at their site though, and they’ve generously offered their assistance in keeping an eye on things. Since the site isn’t monitored nearly as closely as at Times Square, it’s possible there’s more activity going on there than we realize. The Rochester Falconcam wants to extend our gratitude and thanks to Bruce Moyer and all the folks at Kodak, who continue to be terrific partners, and to Ted, Bernie, and all of the falcon fans at Duke Energy for their help and hospitality. 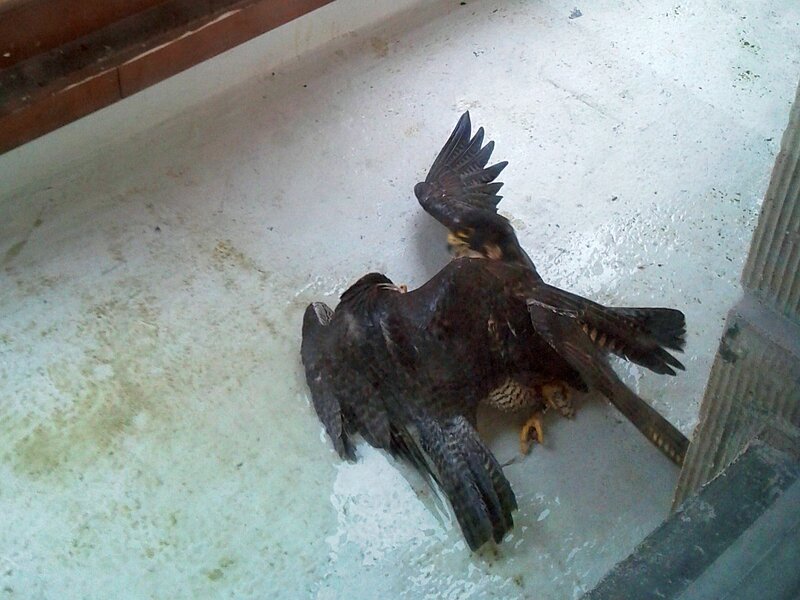 We’re looking forward to seeing what happens at this site with Rochester’s newest Peregrine, Unity. Beauty and Unity Throwdown at Kodak Tower? 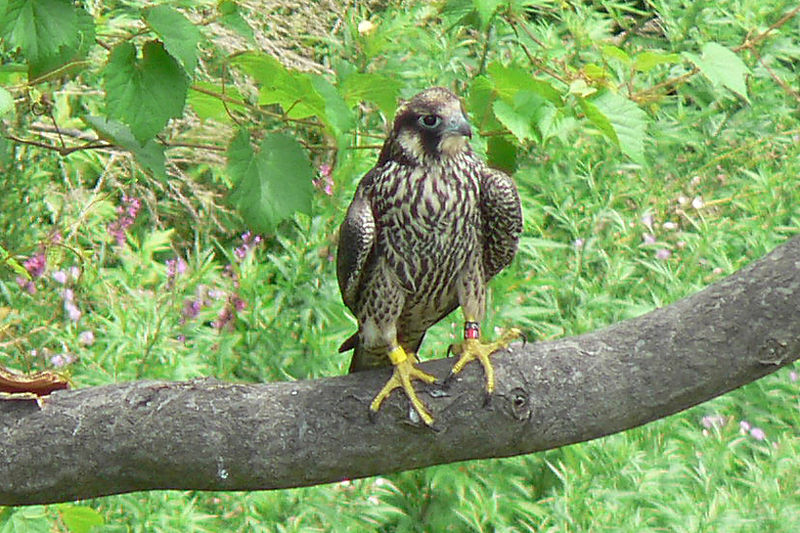 If you look closely at these images (click them to view larger versions) you’ll see that one of the falcons sports a purple leg band, while the other has a black and green band. We know that Unity’s USFWS band is purple, and Beauty’s state ID band is black/green. At the time of the fight, Beauty was not on the nest at Times Square. She had left about 20 minutes beforehand. We didn’t have any watchers at Kodak Park at the time to see whether Unity was there, but the chances that we have 2 adult Peregrines from the midwest US (where they use purple USFWS bands) at this time of year is unlikely. According to the photographer, both birds flew off to the north soon after the photos were taken. Beauty returned to the Times Square nest box later in the afternoon, looking pretty normal for her, and Falconcam team member Carol P reports that Unity was at her KP nest when Carol dropped by around 3:45PM yesterday. So, what’s going on here? 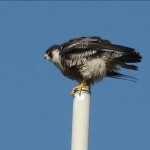 Peregrines’ natural territoriality and aggressiveness is on overdrive during nesting season. We’re hopeful this was nothing more than a territorial spat, rather than a sign of things to come. We’ll be keeping a close eye on the situation going forward, but with any luck this was a one-time dust-up that helped both of our resident females to reinforce their respective territorial boundaries. 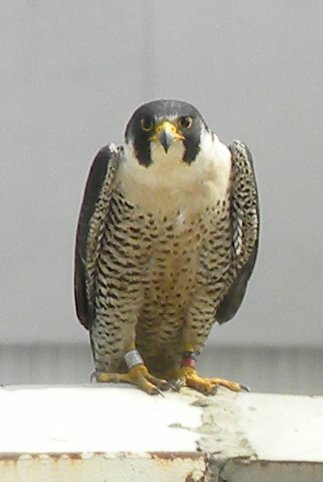 The peregrine falcon that has taken up residence at one of the Kodak Park buildings in northern Rochester defied all attempts at identifying her by her black and red ID band for over a year. The persistence of our watchers paid off in the end though. On New Year’s day Rochester Falconcam team member Joyce took some pictures which made an ID a near certainty, but out of an abundance of caution we waited for an opportunity for a clear photo in bright light. This past Mother’s day was nice and sunny in Rochester. Joyce and fellow watcher “MAK” were back at it, keeping an eye on the falcon. When it flew to a nearby building and landed on an antenna they sprang into action, capturing the pictures you see below. 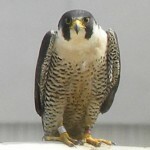 The bird’s ID band is clearly visible, and we’ve confirmed that Rochester’s newest Peregrine-in-residence is Unity. Unity was hatched in 2009 at the University of Toledo in Ohio, several hundred miles west of Rochester. Her ID band is black over red 71/H. So welcome to Rochester, Unity! Even better news is that she has a mate, and may be incubating eggs in a small alcove at the Kodak Park facility. The most surprising news though, may be just who her mate is. 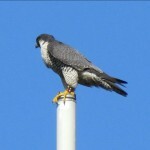 Our watchers are 99% sure that the male falcon who visits with Unity is none other than Archer! The Kodak Park site is only about four miles from Beauty and Archer’s nest on the Times Square building. In fact, the KP site is visible from the Kodak tower and from the upper floors of the taller buildings in downtown Rochester. Watchers stationed at Times Square and Kodak Park have tracked Archer’s comings and goings, and the pattern appears to be very consistent; When Archer is at Times Square there is no male at Kodak Park. When the male is at Kodak Park, Archer is never present at Times Square. This could all just be a weird coincidence, but Archer has some distinctive markings such as a white-tipped feather on his right wing that’s nearly a dead giveaway. 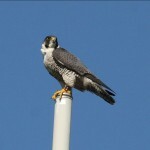 The male banded falcon at Kodak park has an identical light feather on his right wing. 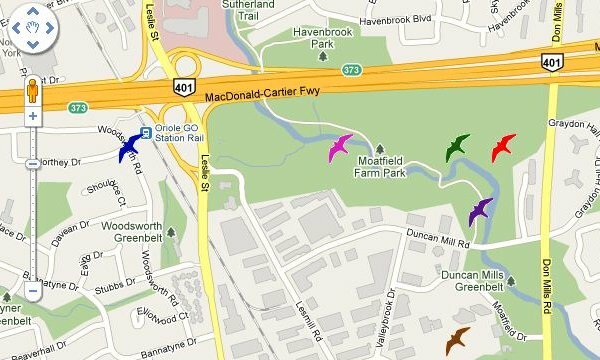 The chances that there could be two males at nest sites only a few miles apart in the same city, with the same distinctive field marks, are– Well let’s just say they’re awfully small. 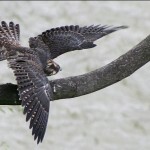 Archer and Unity have been observed copulating and performing all of the activities one would expect of a mated pair of Peregrines including courtship flights and territorial defense against other raptors wandering into the area. It’s not unheard of for a male to mate with different females at multiple nest sites, though it certainly isn’t the norm. Archer spends more of his time downtown than at Kodak Park, so it will be interesting to see how well he is able to provide for two families, assuming that there are young hatched at both nest sites. We’ve informed the DEC about Unity’s identification, and we’ve also sent word to the Ohio Department of Natural Resources to let them know that their girl has found her way here. We are hopeful that the DEC can work with Kodak to install a nesting box or platform at the KP site, and we’re ready to lend our assistance if its requested. In the meantime our crack staff of watchers will continue to keep an eye on both Times Square and Kodak Park to see what develops in this very interesting drama. UPDATE! From our friend Kate St. John at the University of Pittsburg comes word that both Unity and Beauty are related! Dorothy, Beauty’s mother, is Unity’s grandmother. That makes Rochester’s resident falcons aunt and niece.